When I started working at the Community Food Bank of Central Alabama in May, I already knew the basics: The Food Bank distributes 7+ million pounds of food a year to 220+ agencies in 12 surrounding counties who then distribute to families in need. I already knew that they ran a Weekenders Backpack Program where a pack of food is distributed discreetly to children identified as “chronically hungry” on Fridays. I knew about the Produce in Pantries program that gets fresh produce to agencies and families. What I didn’t know was the daily effect it would have on me when given the chance to interact with agencies, community partners, volunteers, and families receiving this food. I could go on and on about the different stories I’ve heard, the challenging circumstances facing families, concerns from families living in rural areas, concerns from families living in urban areas, and even more stories about empty lunch boxes. There is plenty of time share the stories with you as our work goes on, but for now I want to tell you about one of the most surprising events I’ve seen come together so amazingly in Birmingham: Sweet Potato Drop. Gleaning Network: Volunteers glean nutritious produce from farmers’ fields and orchards after the harvest. This food is delivered to those in need. 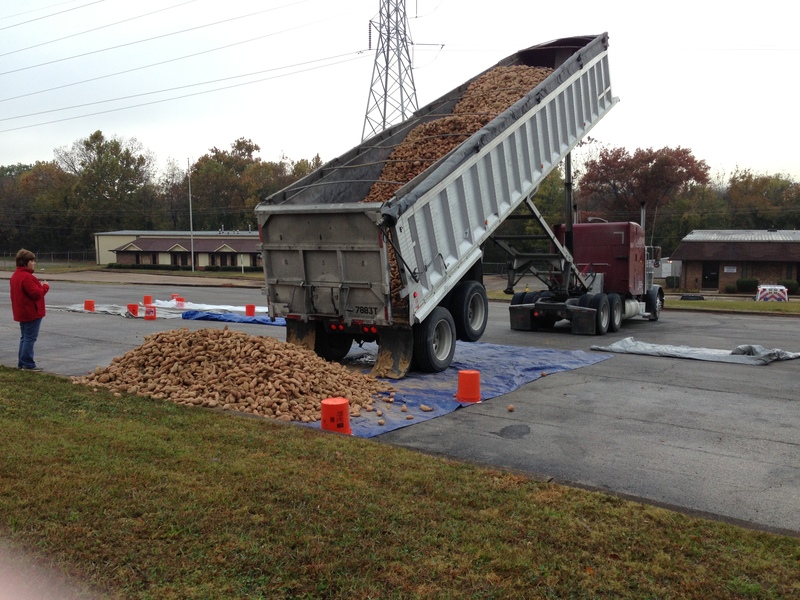 Potato & Produce Project: Truckloads of unmarketable potatoes and other produce, donated by the agricultural community, are delivered to agencies serving the poor. Harvest of Hope: An education program informs people about the hunger problem and encourages them to be part of the solution. The Society of St. Andrew in Alabama is coordinated by Mary Lynn Botts. I don’t really know how to describe Mary Lynn. I think she might have been born with double the energy of a normal human, but she was also given this incredible gift of seeing endless possibilities. She is a force and I love working with her! Mary Lynn coordinates a Gleaning program at Pepper Place Farmers Market where produce is gathered at the end of each market day by volunteers, loaded in our Food Bank truck, and then delivered immediately to agencies in our Birmingham Metro area. 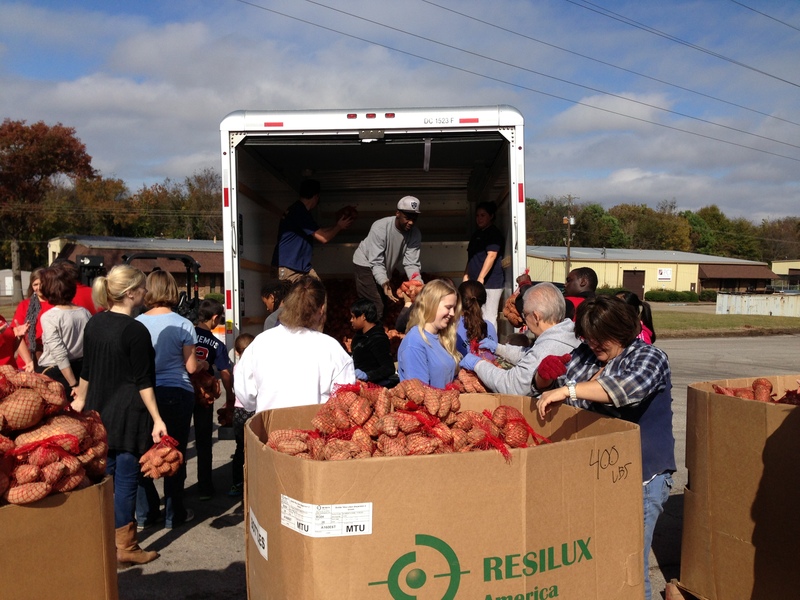 She also recently coordinated a Sweet Potato Drop at the Community Food Bank of Central Alabama on November 16th. The Community Food Bank of Central Alabama paid for and sponsored this event. 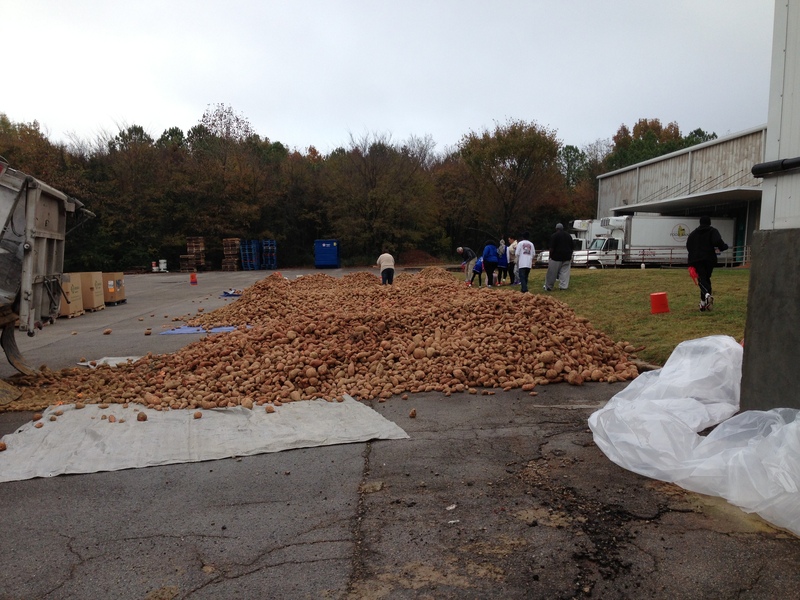 We got there bright and early to watch 40,000 pounds of sweet potatoes fall on large pieces of tarp in anticipation for volunteers to come out and bag them. Weeks prior to the actual event, we sent an email to our Food Bank agencies to see how many potatoes they would be willing to distribute. Mary Lynn recorded that number and coordinated where every single potato would go. In this case, we were amazed at how many of our agencies responded. We also distributed flyers and posted on Facebook a need for volunteers to bag the potatoes in 5 lb bags. Bagging the potatoes helps us know how many pounds each agency is getting and makes it easier for them to distribute to the families they serve. Because this was the first time to do this at the Food Bank, we had no idea what to expect and I can’t even begin to explain how I felt when I looked up at 9 am and saw the LINE of cars filing in our parking lot. By 9:10, we were using overflow parking, and by 9:30 I gave up directing traffic. 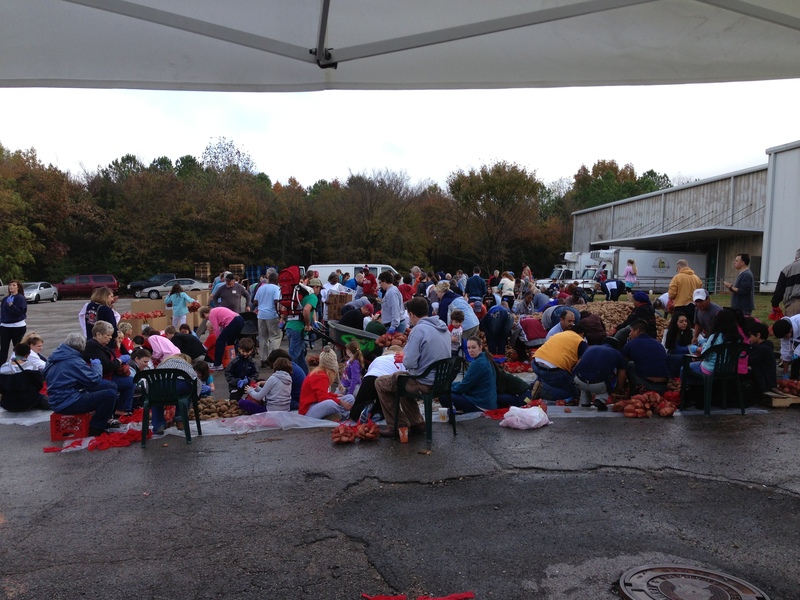 Over 300 people showed up on November 16th to bag potatoes, sift dirt, load agencies’ vehicles, and clean up afterward. I have never seen an event quite like this one. 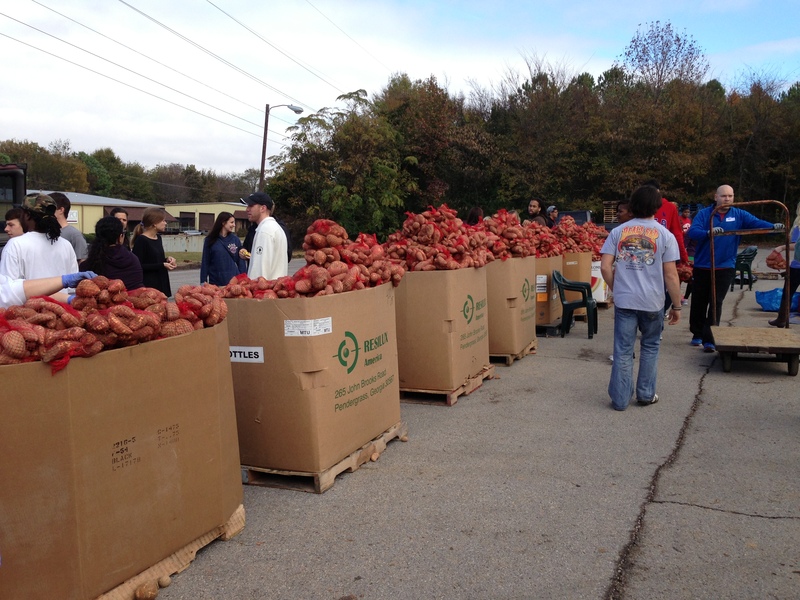 For those of you who missed this event, we are hosting another Sweet Potato Drop in Etowah County on December 7th at the Salvation Army (114 N. 11th Street, Gadsden, AL 35901). Interested in volunteering? Questions about hosting a drop in your area? Contact Mary Lynn Botts: alglean@endhunger.org. We will begin bagging at 9 am and agencies will begin picking up at 10am. We were finished by noon! Stay tuned for more information about these produce drops and the other ways the Community Food Bank of Central Alabama is getting fresh produce to families that need it. Interested in sponsoring? Just contact me at the Food Bank: astorey@feedingal.org. Like Community Food Bank of Central Alabama on Facebook by clicking HERE. Like Society of St. Andrew-Alabama by clicking HERE.